In a large saucepan, melt butter over medium-high heat. Add onion and garlic and cook, stirring often, until softened and translucent, about 5 minutes; lower heat as necessary to prevent browning. Add cauliflower, cream and/or stock, and thyme. Cover, bring to a simmer, and cook, adjusting heat to maintain simmer, until cauliflower is tender, about 20 minutes. Uncover and continue to simmer for another 3 or 4 minutes to thicken the liquid. Discard thyme sprig. Using a blender or immersion blender, blend cauliflower and liquid to form a very smooth purée. Season to your taste with salt, white pepper, drops of lemon juice and a little cayenne. You can adjust purée consistency as needed: Thicken by cooking down further while stirring often over low heat or thin by whisking in liquid, such as stock, cream, or water. Serve warm. Heat 1/4 inch of the oil in a medium deep sided saucepan over medium-high heat. Add the capers and the remaining 1/2 teaspoon thyme and cook until the capers are golden and crisp, about 2 minutes. Add the lemon zest, cook for just a few seconds, and then, using a slotted spoon, transfer the capers, thyme, and zest to a paper-towel-lined plate. 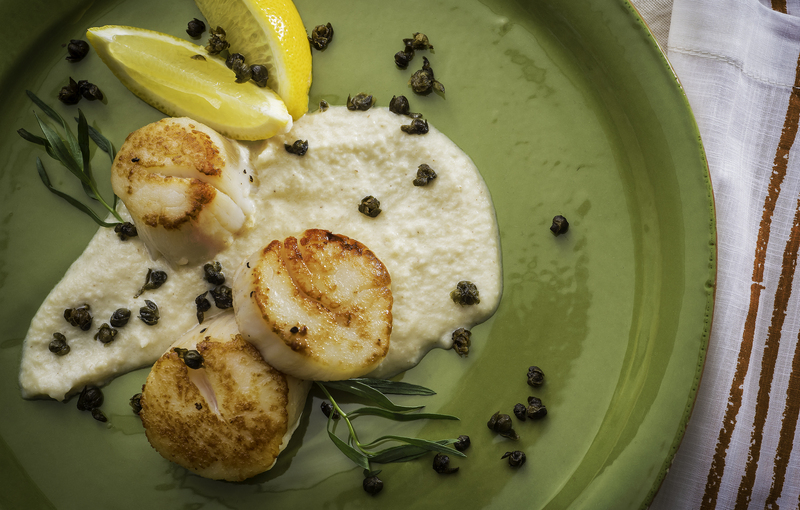 Spoon some of the cauliflower purée among serving plates, and top with the scallops. Garnish with the fried capers and tarragon, and serve.